I do love Berry Bros & Rudd. It’s a delight to shop at as the staff are so enthusiastic. I generally stock up with a random selection of wines that I just don’t see anywhere else, and then pick up a few of their “own brand” wines from specific regions. These are not quite the same as supermarket own label wines, but they do tend to represent good value for what they are. They have a little Bordeaux section, so you can pick a typical wine and know that you’re not taking a huge risk. This Pomerol looks lovely, it’s a rich purple colour with good legs. It smells of fresh berries and plums, but with a chocolately layer too. It’s dry with a medium acidity. There’s a medium level of tannins which are ripe and ready. It’s a medium bodied wine with quite a slug of alcohol, at the upper end of medium, or maybe the lower end of high. Let’s call it a medium-high level of alcohol. That fruity flavour becomes clearer, with raspberries and fresh red plums. There’s chocolate too with just a hint of caffee. Raspberry coffee and chocolate all do go rather well together. 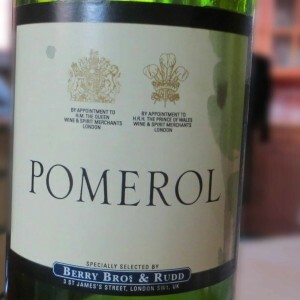 This Pomerol from BBR is lovely. It’s smooth and rich. The flavour lasts well working through from raspberries to plums to chocolate to coffee. It’s almost a meal in its own right. I’ll explore more in the range next time I’m in London or Basingstoke.